SNe Ia are the most mature and well-exploited probe of dark energy, and an immediate route to understanding its nature. SNe Ia remain highly competitive: when combined with Planck and BAO results, current SNe Ia samples measure the average dark energy equation-of-state parameter w to 4.5% (Betoule et al. 2014; Planck Consortium 2015) – the best constraint in the literature, consistent with a cosmological constant. Controlling systematics is the key to future progress. 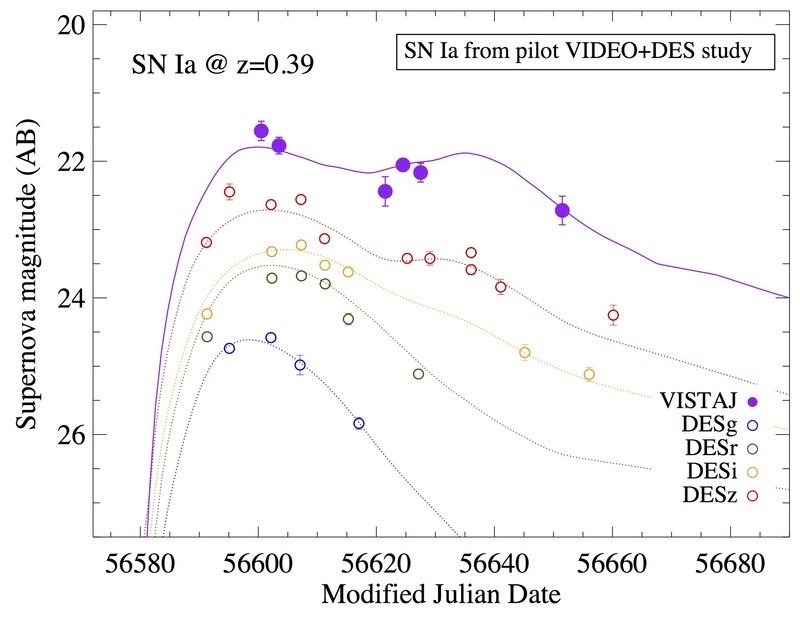 A long-standing concern is the influence of dust extinction on SNe Ia luminosities – the distance modulus for SNe Ia is typically constructed in the blue optical bands (e.g. B) where dust extinction is significant and uncertain. By contrast, observations of SNe Ia from I-band through KS-band demonstrate that SNe Ia are superior standard candles in the NIR, (Kasen 2006, Wood-Vassey et al. 2008, Barone-Nugent et al. 2012) without the need for empirical corrections based on light-curve shape or colour. NIR SN measurements represent 5% distance measurement per event (Mandel et al. 2009, 2011). The corresponding uncertainty for SNe measured in the optical is ⇠7-8% (Betoule et al. 2014). Furthermore, extinction at NIR wavelengths is smaller by a factor of 4 compared to the optical. 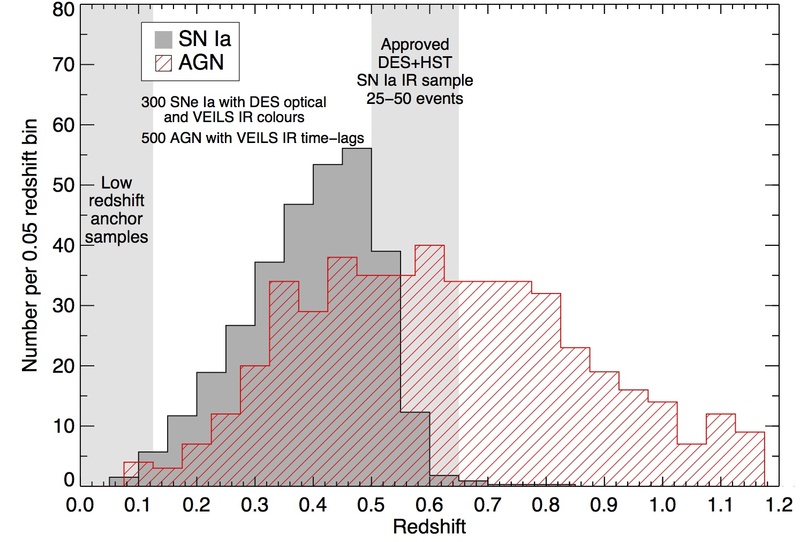 With uncertainties in the colour distribution a dominant astrophysical uncertainty in ongoing and upcoming SN Ia cosmological analyses, VEILS provides an invaluable opportunity to assess and reduce this systematic. The VEILS transient survey will provide a measurement of the dark energy equation of state from SNe Ia with a statistical error comparable to the best present work, with astrophysical systematic errors that are plausibly non-existent. Freedman et al. (2009) hinted at the true potential of this approach by producing the first cosmological rest-frame I-band Hubble diagram of 32 objects, and found an r.m.s dispersion of 0.17, compared to 0.29 in the B-band. The VEILS transient survey will dramatically extend this sample by carrying out the first blind, cadenced wide-area survey in the NIR to produce a sample of ⇠300 well measured SN Ia to z = 0.6 – increasing current samples by nearly a factor of 10..